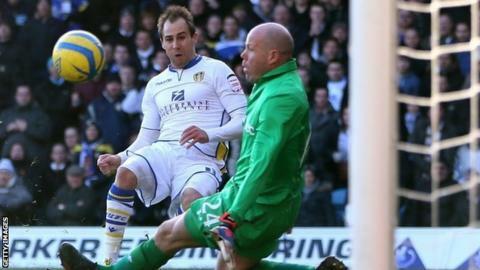 Leeds sent Tottenham crashing out of the FA Cup with a famous fourth-round victory at Elland Road. Luke Varney ran clear to give the Championship side an early lead as Tottenham failed to convert a series of first-half chances. Ross McCormack made it 2-0 after more poor defending allowed him to turn inside Steve Caulker and slam home. Clint Dempsey headed home to give Spurs hope but substitute Jon Obika could not convert his chance to level late on. Tottenham had arrived in Yorkshire fourth in the Premier League and one of the favourites for the Cup, having reached the semi-finals twice in the last three seasons. It is only a decade or so ago since Leeds were in similar company. Although they are slowly climbing back towards the top flight after spending time in the third tier, Neil Warnock's side came into this match in 11th place in the Championship and definite under-dogs. Leeds are into the fifth round of the FA Cup for the first time since 2003, when Terry Venables was manager and they reached the quarter-finals before being beaten by Sheffield United. They also reached the quarter-finals of this season's Capital One Cup, beating Southampton and Everton before losing 5-1 to Chelsea. But despite the decline in their fortunes, Leeds have still sprung a few recent cup shocks - beating Everton and Southampton in the Capital One Cup this season and, as a League One club, beating Manchester United at Old Trafford in 2010. Tottenham boss Andre Villas-Boas picked a strong side - including Gareth Bale and Aaron Lennon - to try and avoid a similar upset but significantly he left Jermain Defoe, his only available out-and-out striker, out of his squad. Clint Dempsey, who led the Spurs attack instead, has played up front plenty of times before in his career but as a lone frontman he often lacked support, as well as composure, in front of goal. Spurs' problem was never about creating openings, with the first of many arriving after seven minutes when Gylfi Sigurdsson headed straight at Jamie Ashdown from 10 yards out, but taking them was a different matter. Even without their top scorer Luciano Becchio, who was left out after handing in a transfer request on Friday, Leeds had no such worries. The first time they came forward, Varney made the most of some poor defending to escape Kyle Naughton and Caulker before running into the area and beating Brad Friedel. The visitors responded with more neat football but they were unable to turn their superior possession into goals. Ashdown kept out a Tom Huddlestone shot, denied Bale at his near post after the Welshman's fine solo run, then pushed away Dempsey's powerful strike from distance. But if Tottenham's finishing was unconvincing, things were a good deal worse for them at the other end. Just before half-time, they failed to deal with a long Leeds ball pumped forward and the ball broke for McCormack who was only denied by a fine block by Friedel. However, there was no escape when McCormack ran clear again after the break. The Scotland striker turned back inside Caulker, who looked uncertain all game, before slamming a shot into the top corner. Dempsey missed from six yards moments later but Tottenham were soon back in it when he sent a header looping into the net after clever work by Bale down the left. That left more than half an hour left for the visitors to find an equaliser but the expected onslaught never materialised. Spurs poured men forward but could not find a clear sight of goal, and were grateful to Friedel for denying McCormack when he looked to finish off a swift counter-attack. The only time they got behind the home defence, Lee Peltier got back superbly to deny substitute Obika with a last-ditch challenge. Friedel went forward to try to salvage a replay deep in injury time but Leeds broke forward instead and Tottenham's disastrous day would have ended with them conceding a third goal had referee Kevin Friend not blown for full-time as Rodolph Austin's long-range shot trundled towards the empty net. Leeds manager Neil Warnock: "I really enjoyed the match. We didn't get anything other than what we deserved today and we had a few chances as well. "It was a typical FA Cup game. They were like that when I was a kid. Tottenham boss Andre Villas-Boas: "We had a good 15 minutes before the goal when we had some good chances, and I think it was important to score early. "It was difficult as we were always chasing the game and this is a difficult place to play, and we couldn't play our football as well as we could have. "We wanted to go through in the competition, but we were knocked out by a Leeds team who were extremely competitive today, and you have to give credit to them."